Mike Huckabee waxed historic this week while denouncing protesters who interrupted Brett Kavanaugh’s Supreme Court confirmation hearings. “Clear the room or start caning them when they open their yaps!” he tweeted, making a backhanded reference to the most famous caning in American history: the 1856 attack on Senator Charles Sumner. 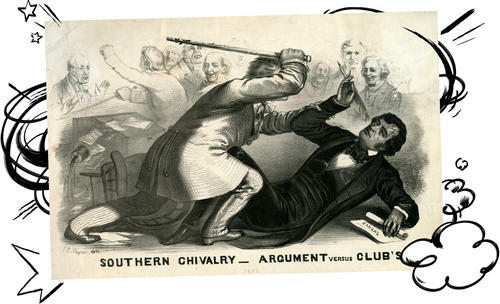 Outraged by one of Sumner’s antislavery speeches, Preston Brooks of South Carolina brutally beat him to the ground in the Senate chamber a few days later, stopping only when his cane broke. Clearly, the United States has a long and storied history of polarizing crises. The 1960s was one such time, as were the late 1790s; in both cases, Americans of opposing politics turned on each other with violent outcomes. The 1850s were even more severe. The period’s raging debate over slavery fractured political parties, paralyzed the national government and divided the nation. In time, this struggle tore the nation apart. In many ways, the crisis of the 1850s played out on the floor of Congress, the focus of national politics for much of the 19th century. A forum for national debate with the power to decide the fate of slavery, it became a bullpen for sectional combat, with armed clusters of Northerners and Southerners defending their interests with fists and weapons as well as legislation.